Day 2 workout session for me is usually on a Wednesday. 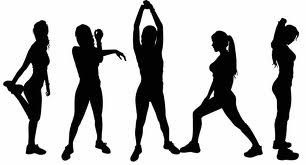 I will not be going through the warm-up, stretches and cool down exercises in detail because, I usually follow the same routine most days I exercise. I have already mentioned these in detail in my previous post ‘Day 1- workout’. 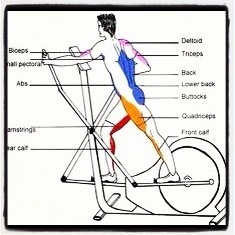 I like altering and alternating my workouts. In this post the cardio exercise, abdominal exercise and the strength training will vary slightly from the previous session’s workout. Taking the stairs down to the gym and spot jogging. A total of 5-7 minutes spent doing this. Arms, back, shoulders and leg muscles stretched. Each stretch is maintained for about 15-20 seconds and repeated twice. On the second day of my workout, I normally avoid high impact cardio training like running. I instead choose to do perform other low impact cardio exercises. This will typically include; rowing, cross trainer/elliptical and cycling. This picture clearly illustrates the muscle group involved. 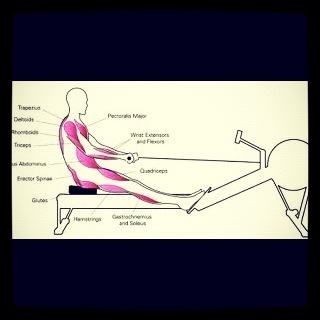 Since I am working on my whole body, I prefer to continue to work on the same group of muscles as rowing. I always keep the setting at a low level (level 3) but I will try and not bring the speed anywhere less than 15km/hr. This is high intensity cardio to me and I will continue doing this for the next 15 minutes. 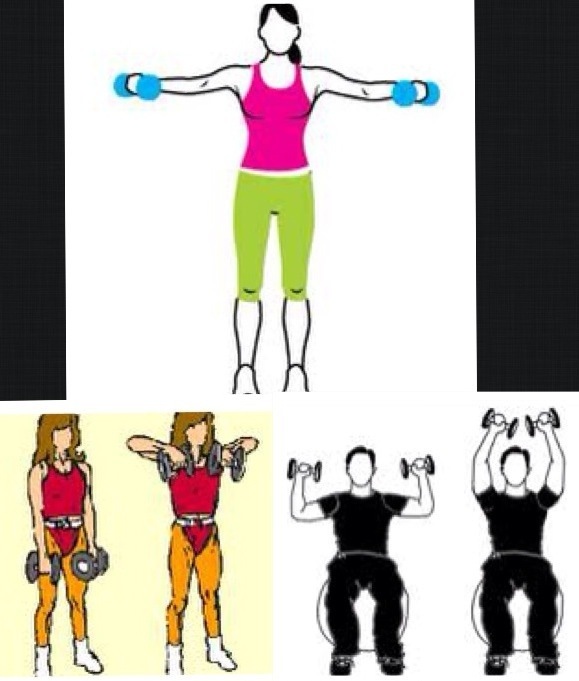 The first 5 minutes, I do the forward workout and the next 4 minutes, I do a reverse/backward workout. I again alternate to the forward workout for the next 2 minutes and go back reverse for 2 minutes and the last minute, I a do a forward workout where I try and increase the speed for 30 seconds and I work as fast as I can. 30 seconds past, I drop the speed real low and let my body recover. 15 minutes past, I later move on to cycling. I have completed a total of 30 minutes, low impact, high intensity whole body cardio exercise before I move on to cycling. I prefer cycling for a moderate intensity workout. I keep the intensity level at level 3 and cycle at 90mph for the next 10 minutes. With this I complete my cardio workout for the day. On this day, I do not work on the machines instead, I carry my free weights (1 kilo on each hand) with me. The drill is to work on my upper and lower body. Bicep curl,triceps kickbacks and overhead triceps extension for arms. Lateral raise, upright rows and overhead press for shoulders. 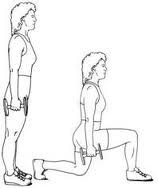 I stick to lunges on this day for a lower body workout. I complete a total of 15-20 reps x 5 sets for both upper and lower strength exercises. 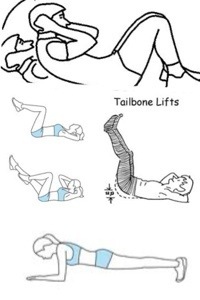 I stick to the traditional abdominal crunches, bicycle manoeuvre, tailbone lifts and plank. 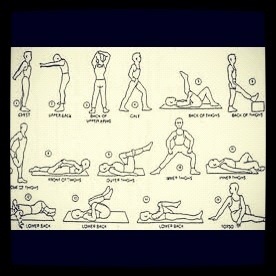 I typically end my workout with a good stretch where I normally follow the same stretch routine as shown in the picture. This completes my workout session for Day 2. Thanks for the tips kav.